When do tremors stop being aftershocks and start being new earthquakes? Most of the thousands of aftershocks that continue to rattle Anchorage and Mat-Su after Friday morning’s magnitude 7.0 earthquake have been too small to feel. Others have sent rocks cascading onto parts of the Seward Highway. Some shook residents awake, like the 4.7 aftershock that struck 9 miles northwest of Anchorage around 3:49 a.m. Wednesday. And some came back-to-back, like the two aftershocks around 12:45 p.m. Thursday that jolted Southcentral Alaska with preliminary magnitudes of 4.8 and 4.1. These lingering tremors have become an annoyance for many residents. As of 2:30 p.m. Thursday, 2,888 aftershocks had been recorded, of which 185 measured at least 3.0, 23 were at 4.0 or greater and five measured at least 5.0, according to the U.S. Geological Survey. That’s left some people wondering: Are the shakes that continue to jolt us several days after the initial earthquake truly aftershocks anymore — or are they brand-new earthquakes? Natalia Ruppert of the Alaska Earthquake Center, based at the University of Alaska Fairbanks, says they are indeed aftershocks. Earthquakes come in clusters, and seismologists refer to the largest one in a sequence as the “mainshock." The earthquakes that occur in the aftermath of a mainshock continue to be called “aftershocks” until the seismic activity in the region returns back to the level it was at before the mainshock, Ruppert said. Compared to the magnitude 9.2 Good Friday earthquake that devastated Anchorage in 1964, this is a fairly tame prediction. 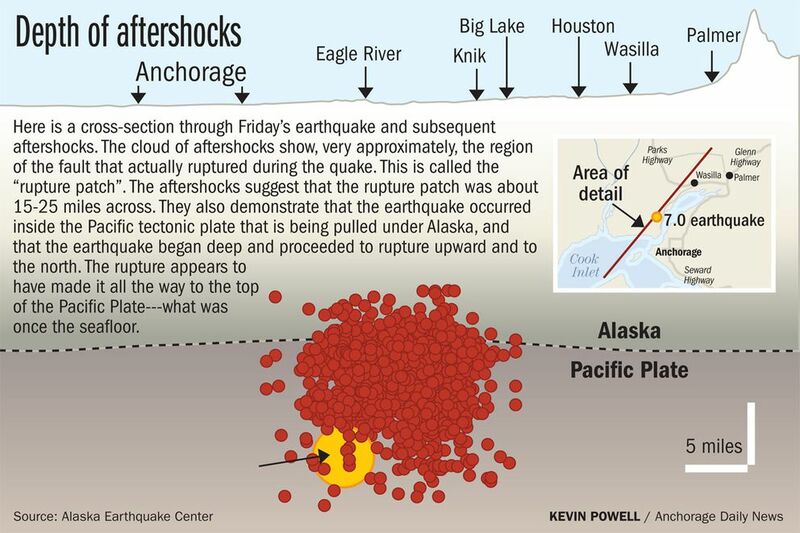 Aftershocks continued for more than a year after that quake, according to the Alaska Earthquake Center, and in the first day alone, 11 aftershocks registered a magnitude of 6.0 or greater.